Does this mean native USB-C support isn’t far away? If you’ve been holding your breath for Microsoft to finally bring USB-C connectivity to its devices beyond Surface Book 2, hold onto it just a little while longer. 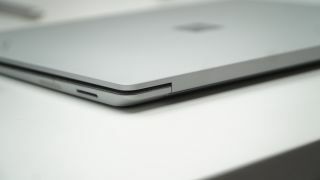 The Verge reports that Microsoft promises to release its USB-C dongle for the Surface Connect port before the end of 2018. Specifically, a Microsoft spokesperson told The Verge that the USB-C Surface dongle is “on the roadmap for later this year”. This comes after the firm clearly missed its previous target launch of 2017, having teased the product back in May of last year alongside the Surface Pro debut. Further to this point, infamous Microsoft leaker WalkingCat on Twitter posted a purported render image of the dongle. Judging by this render, the dongle will support a single USB-C connection, which seems odd considering the thing’s size and the port it connects can otherwise support several connections at once. Will Microsoft finally go all-in on USB-C? There’s no clear reason as to why the USB-C Surface dongle missed its mark last year and has been delayed through to the end of 2018, and pricing has not been mentioned. However, this is a strong indication that the next line of Surface Laptop and Surface Pro products will include USB-C ports within their chassis. And, frankly, it’s about time. We’re at last at a point where USB-C is reaching ubiquity, and perhaps Microsoft sat on this a tad too long – while its competitors adopted the technology a bit too quickly. You can’t seem to win with these things. While the news of a USB-C dongle for Surface Pro and Surface Laptop is exciting for those who’ve amassed a collection such accessories over the past year, this is perhaps even more interesting for what it may mean for future editions of those two products altogether.